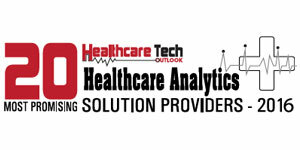 In today’s healthcare sector, predictive analytics coupled with technology and statistical methods helps in analyzing data to generate insights for individual patients to improve healthcare. Advanced technology integration not only simplifies the analytics process but also delivers real-time data value. ZirMed combines innovative software with the industry’s most advanced transactional network and predictive analytics platform to improve the business and process of healthcare. The company delivers comprehensive end-to-end cloud-based business and clinical performance management solutions to meet the challenges of managing population health and optimizing fee-for-service and fee-for-value reimbursements. ZirMed’s data mining algorithms scrutinize every element on an account and provide insights and advanced workflow that organizational staff needs to pinpoint and correct breakdowns that reduce reimbursement—whether they come from an overlooked charge, a bundling issue, a missed diagnosis, or a misinterpretation of an operative report. ZirMed’s proprietary big data analytics centralizes disparate hospital data sources and extract actionable insight to help users proactively curb revenue leakage and optimize workflow throughout the revenue cycle. The company also offers users interactive KPIs and streamlined reports making it easier to track denials, AR days, payment posting, and other key business metrics. Leveraging a customizable dashboard, users can more effectively create benchmarks that track performance by specialty. Other key features enable users to change dates quickly and view information on one or multiple practices at once. Many of these features expand ZirMed’s analytic solution’s ability to meet enterprise needs with role-based views and executive-level dashboard reporting. The company’s analytics tool has allowed numerous healthcare clients to successfully monitor and measure the most important aspects of the claims adjudication process giving a complete transparent picture of what is happening with data at all times. “ZirMed’s analytics tool provides valuable answers to difficult questions found in a simple user-friendly environment,” says Larry Buller Jr., Director of Technology & Client Development, Medical Billing and Management Services. ZirMed’s analytics applications are all connected to live revenue and performance data so provider organizations have the most up-to-date metrics. With solutions that are designed to improve efficiency, effectiveness and quality, for the future ahead, ZirMed is committed to helping healthcare providers meet the new challenges of value-based care.